Spring Awakening! Capricorn, Your April 2019 Horoscope Is Here! Lets look at the month ahead in detail, Capricorn! For you, Capricorn, these rumblings and transformations occur in your sign, and the zone of ‘self’, your ego, your physical presence (and constitution), and how you affirm you personal space and sense of independence. Therefore you might be transitioning and claiming your power, or shedding layer upon layer of who you are. Bear in mind that these are long-term developments and not confined to April in particular. January’s new moon eclipse in Capricorn and the past two years of Saturn in Capricorn have also touched upon this area, and the renewed perspective you now have on you. Depending on seeds you’ve sown, and how you allow space to transform and reincarnate, you may now encounter notable developments. Think: humility, letting go of ego, restructuring, allowing what must go to go – and accepting any lessons there may be in health related issues. On the 2nd and 3rd of April the moon will join Venus, Mercury and Neptune in Pisces, and the area of your horoscope governing your inner circle (school friends, peers, colleagues), and learning to communicate with those in your local and immediate surroundings. Mercury (now direct in this fluid, foggy realm) will be exactly conjoined Neptune, planet of compassion (but also delusion), charity as well as transcendent thought. It’s an ideal weekend for deep reflection – particularly around your connection to others, and how you learn and grow with the help those around you. Consider projects among likeminded folk that have recently been pertinent. Journal, and bring your musings full circle. The New Moon in Aries arrives on the 5th April (at 8.50 am GMT) at 15º of the sign. This is a moment to pull back into a womb-like space, to claim a fresh start for home life and your domestic realms. It’s an ideal time to think about where you live, as well as family, your roots and ancestry; image the best version of your literal or emotional foundations, and how it runs strong. Think about how you feed and nurture yourself. Note, you might not want to go full throttle into your nest, as sun and moon are in tension with planets at this new moon. A personal relationship could challenge the sanctuary you’re dreaming of, and you may need to strike a balance between the plans you have around household matters with navigating a person in your midst. Sunday April 7th has the potential to deliver clarity – particularly through conversations with close friends, someone from your local community – as Mercury and Saturn align. It’s a time that allows you to make better sense of your own message in your inner circle, how you relate to others – individually and in a group. This day could helps you intuit what it is you’re wanting to say; reflect on how you come across and your beliefs. Note how far you’ve established your own perspective and outlook, and allow your connection to others to reveal the steadfast and enduring nature of your personal perspective. We’ve an interesting day Wednesday April 10th, as the warm, emotionally charged sun (in Aries) comes into tension with serious Saturn; you may want to create a cosy hearth and settle into an inviting resting spot – but go steady. Anticipate some kind of personal demand that prompts you to redirect your attention. Venus, Neptune and Mercury in your sociable zone of connection and clever thinking will bring you ideas and a gracious, silver tongue, helping you to express your intentions to those around you. It’s on this day, too, that Jupiter begins its retrograde, which presses pause on projects you’re working on behind the scenes; this could be something that’s under wraps – a bad habit you’re overcoming, a more spiritual agenda you’re investigating and learning about, or even the preparation of a personal launch or business – it’s an area that’s likely to have experienced a boost in attention and interest since November 2018. Imagine a bun in the oven – perhaps it’s a baby or love affair! Soon after (on the 12th) Mercury clashes with Jupiter, and on the 15th Venus clashes with Jupiter, which suggests that two areas of life may be struggling against each other (i.e. your private life, vs. your place among community and friends). It’s been challenging for Jupiter since he entered Sagittarius back on November 8th, with planets in Pisces overwhelming his ability to flourish and bloom, and it could continue to be hard to embrace the full potential of Jupiter this year. 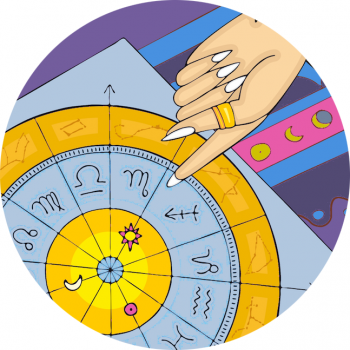 Jupiter Retrograde offers a chance to think over your goals for a these plans incubating, and personal growth just for you, how it’s developing and how it will continue to evolve the rest of the year. Easter weekend begins with the second Full Moon in the zodiac sign Libra, Friday April 19th (11.12 am GMT). The moon peaks at 29º Libra, a moment to celebrate professional accomplishments, or who you are in the world at large – your calling and public position. With the moon peaking in your zone of fame and accomplishments, shine a light on how you’ve managed your reputation, work life and how you come across to those around you. What shifts have been most pertinent? They may come up for you now, and may also be related to certain friendships or group dynamics. The sun then moves into Taurus, and you zone of hobbies, children, play, creativity, fun, dating and recreation! Time to enjoy yourself for a full month, Capricorn! On Sunday April 21st Venus moves into Aries, signalling a time to relish the shifts at home you were thinking about on the 5th – think: home improvements and pleasure on home turf. It may actually be uncomfortable at first but will get easier into May. Motivator Mars enters Gemini on the 31st March, and spends April moving swiftly through your zone of work, habits, health and wellness and the schedule you engage with everyday. You could be raring to go and extra productive all month, save for one day. On April 27th, Mars will clash with Neptune in Pisces, so that while part of you is keen to complete the tasks at hand, another wants to connect and answer the call of those around. You could be powering ahead at work and have a friend that needs you… Balance your job and your social scene accordingly.